Positioned amidst the range of Satpura in Hoshangabad district of Madhya Pradesh, Satpura National Park is a pristine wildlife habitat that is spread over an area of 524 sq. km. It was first introduced by the popular bird watcher Dr. Salim Ali in the year 1981. In the same year, the park covers an area of 1427 sq km by adjoining Bori Sanctuary (486 sq km) and Panchmarhi Wildlife Sanctuary(417 sq km), making a unique central Indian highland ecosystem. By the year 1999, the park was added to Tiger Project Network and became Bodi-Satpura Tiger Reserve. Well, this place captivates one who is keen interested in archaeology as there are plenty of rock shelters of ancient period that are embellished with beautiful paintings. En route you'll find the rugged landscapes commemorated with sandstone peaks, narrow gorge, ravines, and dense forests that make it an inimitable creation of the nature. It's the place where every wildlife buffs must visit to enjoy the view of jungle, lovely hilly terrains, rivulets and unswayed forest, etc. Very rich in biodiversity, the wildlife of Satpura covers a huge range of flora and fauna including rare species of mammals, birds, reptiles and plants. As per the record, Satpura National Park won the TOFT Wildlife Tourism Award in the year 2010 for ‘most visitor friendly’ wildlife destinations. Flora and Fauna of Satpura National Park The vegetation of Satpura Park looks striking with 1300 species of flora including teak, sal, tendu, mahua, bel, bamboos, grasses, bushes, and many other medicinal plants with therapeutic and medicinal properties are also widespread over here. While, the fauna of Satpura National Park is a stunning jungle treat for wildlife enthusiasts. One can enjoy spotting different species of animals like leopard, tiger, chital, nilgai, four-horned antelope, bhedki, rhesus, monkey chinkara, wild boar, buck, fox, flying squirrel, Indian joint squirrel, to name a few. Apart from these, there is also a huge species of birds like Malabar pried hornbills, crested hawk eagles, honey buzzards, paradise flycatchers, thrushes, pheasants, peafowl, to name a few. Wildlife Safaris in Satpura Satpura National Park is the ultimate paradise for wildlife enthusiasts as one may get enthralled with the striking hilly terrains, peaceful jungle, deep gorges, streamlets, unswayed forest locations, and many more. Snuggled in the lap of Satpura ranges, the park is amongst the most beautiful nature reserves of India. One may plough ahead to relish the Jungle Safari by Jeep, boat or on elephant back. Only 8 persons are allowed to sit during jeep safari in which 1 guide and 1 driver are required to go along with the visitor during park safari or game drive. It is one of the best ways to explore the wildlife. Most Importantly, Satpura chains a small herd of riding elephants which are especially used for spotting tigers and then put on a 'tiger show', which is organized by park management during Monday Safari. For Tiger Show, you need to pay a fixed fee to the official then only you are allowed to spot tigers or to do photography. Apart from elephant and jeep ride, boating in Denwa River is also one of the best experiences that one can have in their lifetime. Boat Safari in Satpura bids a great opportunity to witness the beautiful hills and thrilling wildlife of the forest. You can spot a huge species of birds and animals while paddling mutely along the border of jungle. Nearby Tourist Attractions to Visit: After completing the wildlife tour in Satpura, you may take an excursion to below mentioned nearby destinations to add more fun, thrill and delight to your trip. Pench National Park- It's a popular wildlife park located on the edge of Madhya Pradesh and Maharashtra states. 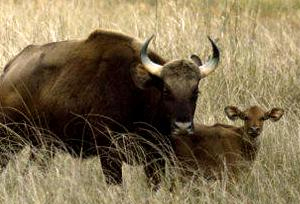 This park is a home to large herds of Gaur, Sambar, Tigers, Nilgai, Wild Dog, and Wild Pig. Other rare species of animals include Chousingha, Chinkara, Barking Deer, Jackal, Palm Civet, Hyena, and many more. Kanha National Park- Located at the distance of 380 km from Satpura National Park, Kanha National Park is well known for its scenic and wildlife reserves in Asia. The main wildlife attractions of this parks include tiger, gaur, sambhar, chital, barking deer, black buck, chousingha, Jungle cat, python, pea fowl, hare, monkey, leopard, etc. Nauradehi Wildlife Sanctuary- It's a famous wildlife reserve in Madhya Pradesh which is a part of 5500 sq km of forested landscape. Wildlife lovers can spot a huge species of animals like tigers, leopards, wild dogs, foxes, blue bulls, sambhars, chitals, chinkaras, bears, etc. Pachmaarhi- It's the only hill station in Madhya Pradesh which is situated on a plateau at 2500 ft above sea level. The place offers an exciting views of old worlde charm. It's a wonderful destination for the one who seeks a leisure walk or trekking. By Road : Satpura National Park is well connected to several cities by road including Bhopal (Approx. 180 Km), Jabalpur (Approx. 360 Km), Chindwara (Approx. 360 Km), and Nagpur (Approx. 265 Km). Best Time to Visit: Satpura National Park remains open from 16th October till the month of June. Wildlife lovers can visit Satpura during this time to enjoy safari rides and boating. 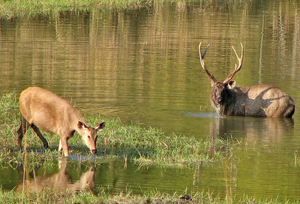 So, if you're in Madhya Pradesh, then you must take a quick trip to this wildlife destination . Make sure you are carrying binoculars and digital camera with yourself so that you can enjoy spotting and snapping rare species of animal, birds and plants.